http://www.smorgasbordet.com/pellesc/ wrote: Pelles C is a complete development kit for Windows (and Windows Mobile, but this platform is fading away). It contains among other things an optimizing C compiler, a macro assembler, a linker, a resource compiler, a message compiler, a code signing utility, a make utility and an install builder. 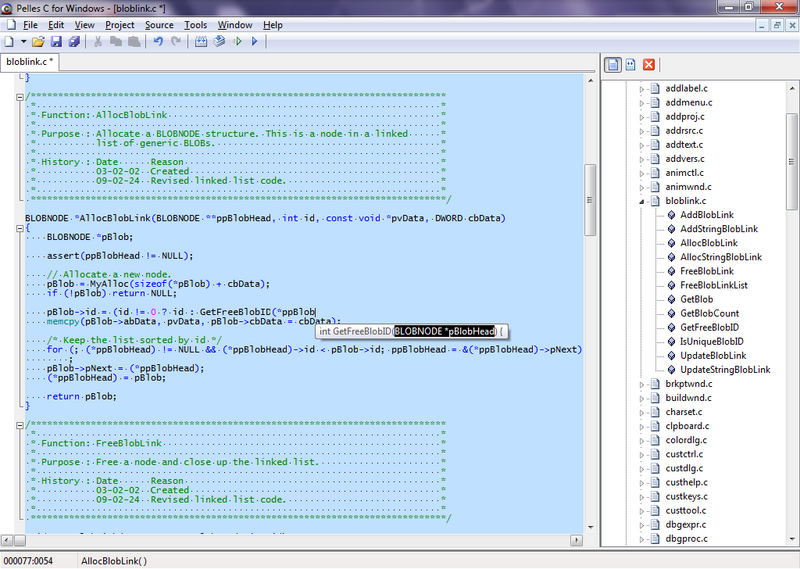 It also contains an integrated development environment (IDE) with project management, debugger, profiler, source code editor, and resource editors for dialogs, menus, string tables, accelerator tables, bitmaps, icons, cursors, animated cursors, animation videos (AVI's without sound), versions and XP manifests. The compiler is originally based on LCC (by Chris Fraser and David Hanson), but since then enhanced with support for C99 and C11, a global optimizer, a new register allocator, a function inliner, intrinsic functions, and many Microsoft C extensions. The install builder for Windows is originally based on NSIS from Nullsoft. I'm no programmer so I don't feel qualified to test Pelles C. A portable version is planed -- and portability seems possible (discussions at http://forum.pellesc.de/index.php?topic=1392.0 and http://forum.pellesc.de/index.php?topic=4560.0). Download latest 32 or 64 bit version (v7.00) at http://www.smorgasbordet.com/pellesc/. Wait. I thought Pelles C is portable. You must use the /xml PellesC.xml command line and it will then store all the settings in the executable folder. Just write a batch file for that and you're set. And I do remember that all the files are saved there. Enternal wrote: Pelles C is portable. @webfork: I suggest this topic be moved to 'Submissions'. Topic update: a new v9.00 of Pelles C is in the works (changelog at www.smorgasbordet.com /pellesc/changes_800_900.htm).